This book is about the metanarrative and metafictional elements of J. M. Coetzee's novels. It draws together authorship, readership, ethics, and formal analysis into one overarching argument about how narratives work the boundary between art and life. 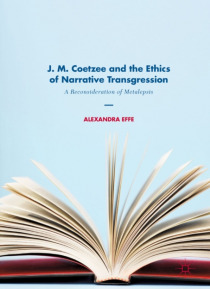 On the basis of Coetzee's writing, it reconsiders the concept of metalepsis, challenges common understandings of self-reflexive discourse, and invit… es us to rethink our practice as critics and readers.This study analyzes Coetzee's novels in three chapters organized thematically around the author's relation with character, reader, and self. Author and character are discussed on the basis of Foe, Slow Man, and Coetzee's Nobel lecture, 'He and His Man'. Stories featuring the character Elizabeth Costello, or the figuration Elizabeth Curren, serve to elaborate the relation of author and reader. The study ends on a reading of Summertime, Diary of a Bad Year, and Dusklands as Coetzee's engagement with autobiographical writing, analyzing the relation of author and self.�It will appeal to readers with an interest in literary and narrative theory as much as to Coetzee scholars and advanced students.